Iowa State University's annual awards ceremony honored nearly 60 faculty and staff, including two genetics, development and cell biology (GDCB) professors. 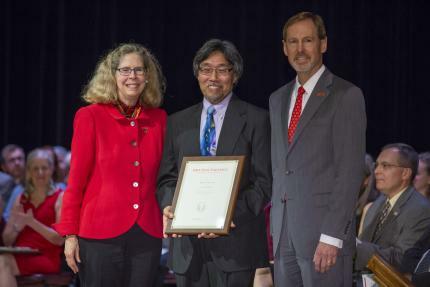 Thomas Peterson received the Regents Award for Faculty Excellence, and Donald Sakaguchi received the title of Morrill Professor at the Sept. 14 event held in the Memorial Union. Peterson's award is presented by the Iowa Board of Regents, and it recognizes commitment to ISU, professional reputation and esteem among peers. Peterson is a professor of GDCB and agronomy. He joined ISU in 1993 as an associate professor. He received his bachelor of science in zoology from the University of California-Davis and his Ph.D. in biochemistry and molecular biology from the University of California, Santa Barbara. Sakaguchi's award recognizes long-term and sustained excellence in the teaching mission. Sakaguchi received his bachelor of science in biology and his Ph.D. in neurobiology from the State University of New York-Albany. He joined ISU as an assistant professor after serving as a postdoctoral scholar and research biology at the University of California-San Diego. He is an adjunct professor of biomedical science at ISU's College of Veterinary Medicine. 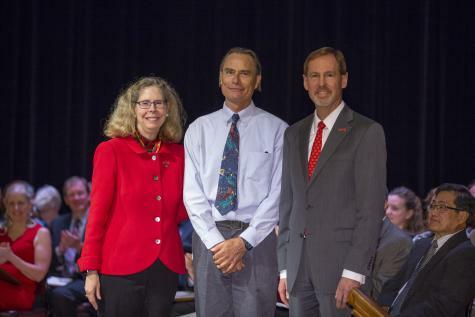 Iowa State President Wendy Wintersteen (left) and ISU Senior Vice President and Provost Jonathan Wickert (right) congratulate Thomas Peterson, professor of genetics, development and cell biology and agronomy. Peterson (center) received the Regents Award for Faculty Excellence. Iowa State President Wendy Wintersteen (left) and ISU Senior Vice President and Provost Jonathan Wickert (right) congratulate Donald Sakaguchi, GDCB professor. Sakaguchi (center) received the title of Morrill Professor.